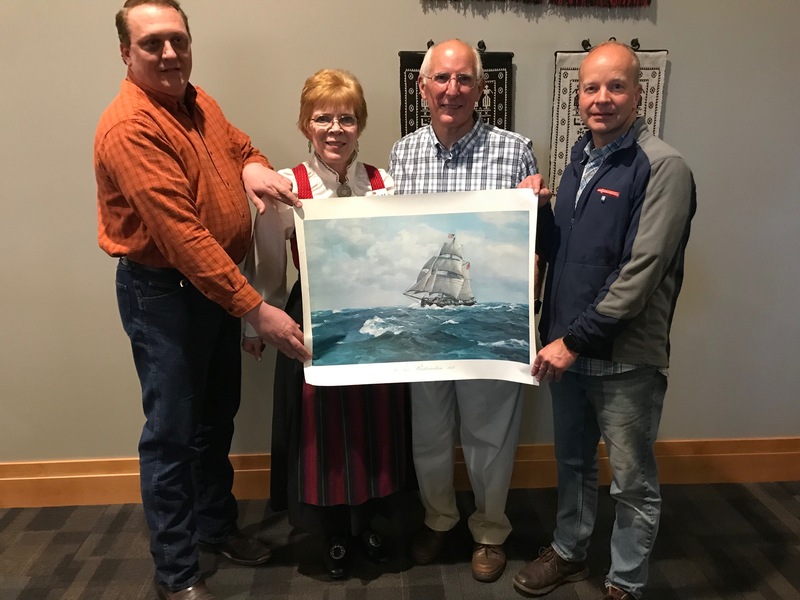 The 93rd annual meeting of the Norwegian Slooper Society of America was held in Norway, Illinois on October 7th, 2018. 154 people attended including the Stoughton Norwegian Dancers. The current board and guests honored the previous board members for their 25 years of service to the Slooper Society. Pat Hayes, Wes Hougsted, and Lou Wise were each presented with a certificate acknowledging and thanking them for their many years of service. Vesterheim Gold-Medalist knife maker Perry Straw had a wonderful display of his beautiful creations. Additionally, Perry also represented the Friends of the Viking Ship and he took great pride in explaining this historically important ship. Dale Goodman briefly spoke on the significance of the Sloopers, the foundation of the Norwegian Slooper Society of America in 1925, and the upcoming bicentennial celebration of the Slooper’s arrival in America in 2025. The Stoughton Norwegian Dancers stole the show with their entertaining and engaging presentation of traditional Scandinavian folk dance and authentic Norwegian bunads. The group of Stoughton High School School Sophomores, Juniors and Seniors put on quite the show and even managed to teach the Sloopers some new dance moves. The main program this year featured Bill Injerd, the “unofficial” historian of the Slooper Society. Bill presented an engaging audio-visual presentation on, “Norwegian-Americans and World War One” in celebration of the end of that war 100 years ago on November 11, 1918. Thank you to Bill for his hard work and dedication to preserving the rich heritage that binds us together… the Norwegian-American experience. We enjoyed the company of some special guests. Børge Wermundsen and his companion Inger Johanne Flaata joined us from Oslo. The couple are on a 4-week tour of the midwest in a rented motorhome. In addition to beautiful Norway, Il they have already visited Decorah, IA and plan stops in Sioux City, Pierre, Bismarck, Minot, Fillmore, Grand Forks, and Minneapolis. God tur Børge and Inga! The annual election of Board Members was held. In addition to preserving the current Board consisting of Steve Southcombe (President), Kirk Mies (Vice President), and Renée Mies (Secretary), we are excited that three new additions were made to the Board. Erin Kauffman joins as the newly appointed Treasurer and Jan Rosdail-Aegerter and Dale Goodman were appointed as Board Trustees. Thank you for your willingness to serve! Perry Straw (right) shows off his knives to Ralph (Ole) Johnson. This entry was posted in General on October 8, 2018 by Kirk Mies. This past April during our visit to Livsreise Renée and I had the pleasure of meeting David and Ruth Amundson of the History Alive Project. 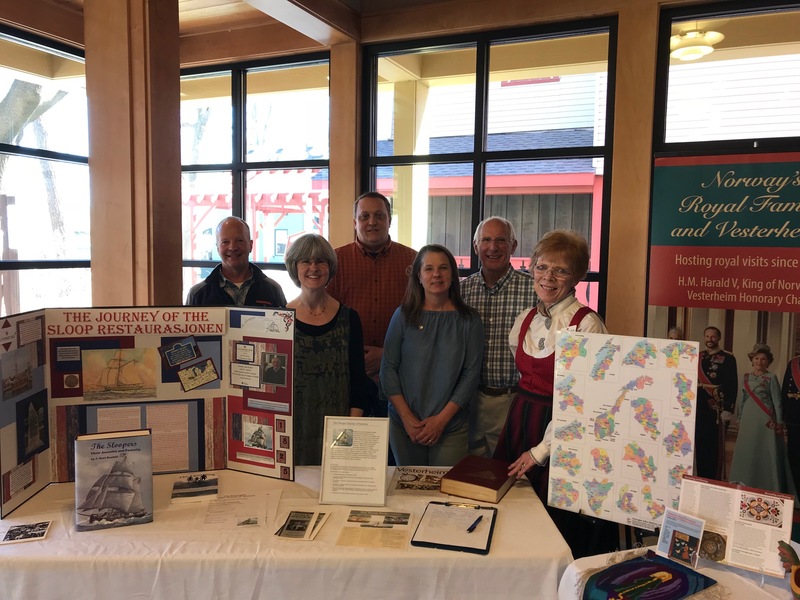 Through their project, David and Ruth work with both the local community and schools of Westby, WI to, “…create out of the box projects to discover and maintain the Westby area’s history for community members of all ages”. They even teach the students about the Sloopers, Cleng Peerson, and the importance of this first organized immigration to America. The Amundson’s project sounded fascinating and this couple’s passion for their project is truly captivating and so Renée and I put a visit to Westby on our to-do list for this summer. Through the years David and Ruth have acquired many interesting artifacts and pictures in an attempt to demonstrate and preserve the fascinating history of Westby and it’s residents. 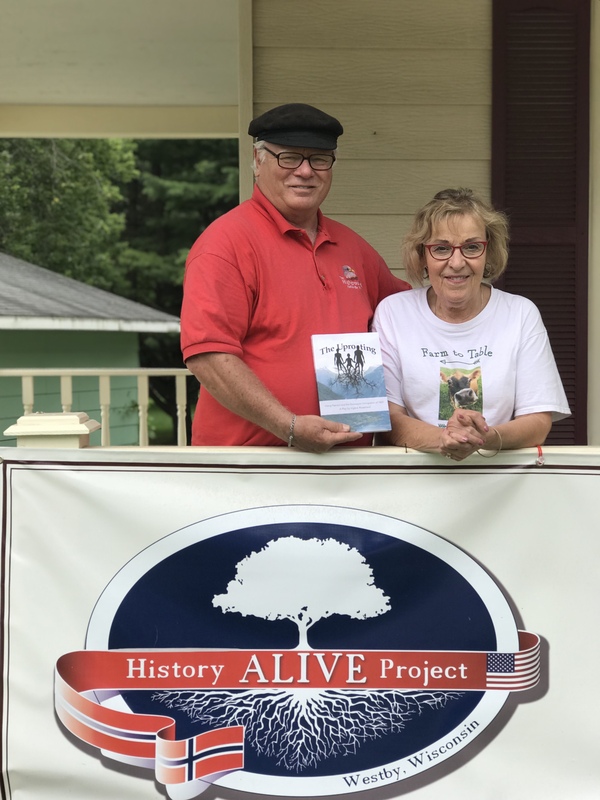 Eventually this collection outgrew their home and so the Amundson’s purchased a beautiful and historic home located on 218 North Main Street in Westby in order to house their collection and serve as the headquarters for the History Alive Project. Renée and I presented David and Ruth with a copy of, “The Uprooting” by Vigleik Rosseland. We thought The Uprooting story would match well with History Alive Project’s mission. If you have time, we would encourage you to visit the History Alive Project, beautiful Westby and the Amundsons. For more information and to view some great examples of the pictures the Amundson’s have collected visit History Alive Project website and the History Alive Project Facebook page. This entry was posted in General on July 29, 2018 by Kirk Mies. Sloopers Kirk Mies, Susan Goodman, Steve Southcombe, Renee Mies, and Dale Goodman with Livsreise’s Marg Listug. 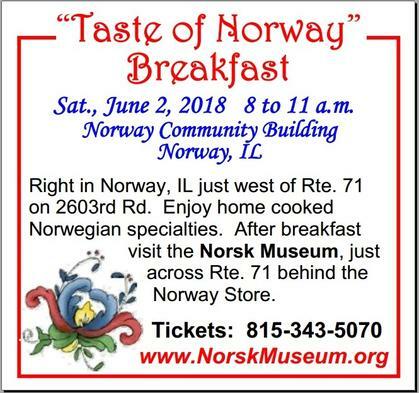 On Saturday, April 28th, 2018 our own Dale Goodman was the keynote speaker at the Livsreise Norwegian Heritage Center in Stoughton, WI. Dale gave a wonderful presentation detailing the events leading up to the voyage, why it took until October 9th for them to reach America, what happened in the new colony they established in Kendall county, NY and ultimately how they ended up in what is now Norway, Illinois. Dale spoke to a standing-room-only crowd of more than 100 people and entertained many questions from the audience after his presentation. Dale’s presentation was entertaining and informative. The Sloopers manned an information desk at the event and it was fantastic to meet so many people who were excited to learn more about the Sloopers and the American Slooper Society. This entry was posted in Sloopers Out and About on April 30, 2018 by Kirk Mies.